It’s been over 20 years since I have made a trip to Lebanon to visit family. Yikes! I didn’t realize how long it had been until I calculated the years. Kind of like me thinking 30 years ago was in the 70s, but actually it was the 90s…how did this happen??? Anyway, my last trip to Lebanon I was 17 years old. Young, excited, rebellious! My grandfather, may he rest in peace, I’m sure had a blast with the shenanigans I pulled. Even though I was young(er), the sense of livelihood and excitement was there for everyone. Huge gatherings with friends and family that occurred regularly, always centered around food. In Middle Eastern countries, we celebrate everything with food! Mezze, is the equivalent to a MASSIVE charcuterie board here in the United States. When you walk into a home, food is immediately offered and you are expected to eat. Mezze is a spread of many different appetizers and usually enjoyed with a drink such as arak. Some common dishes include hummus, labneh, fresh pita bread, olives, baba ganoush, chicken, grape leaves, cheeses, veggies and more. A table is spread with endless food options but yet, no one eats a large meal. It’s just small bites you can enjoy leisurely. That’s the thing, everything is slower and not rushed in Lebanon. People take the time to enjoy each other’s company, enjoy the food, dance, talk and spend hours enjoying the afternoon or evening. I read this article a while back in the NY Times, it was titled, How to Throw a Relaxed Parisian Dinner Party. As I read it, I thought to myself, this was what life was like in Lebanon. Dining with friends and family and enjoying every moment. Being in the moment. Talking, eating, enjoying life and the company of friends and family. The best conversations and friends come around a table to enjoy food. Now in my 30s, full family, lots of friends, one of my favorite things to do is entertain. I love to feed people, just like my parents do, just like their parents did and all my aunts and uncles still do. It’s not me, it’s cultural. It’s a way of a life, a way we grew up learning to share what we have, especially food. For me, being Lebanese is not just where my parents came from, it’s a link to my culture, my history, my family. As I continue to grow and learn about food, culture and the art of entertaining, I continue to circle back to my amazing heritage. This month, a group of amazing bloggers are celebrating the art of Arab food by using the hashtag #AprilisforArabFood . Follow along to see all the amazing creations from various Arab countries all over the world. The most amazing part is each post not only shares food, but stories and memories. 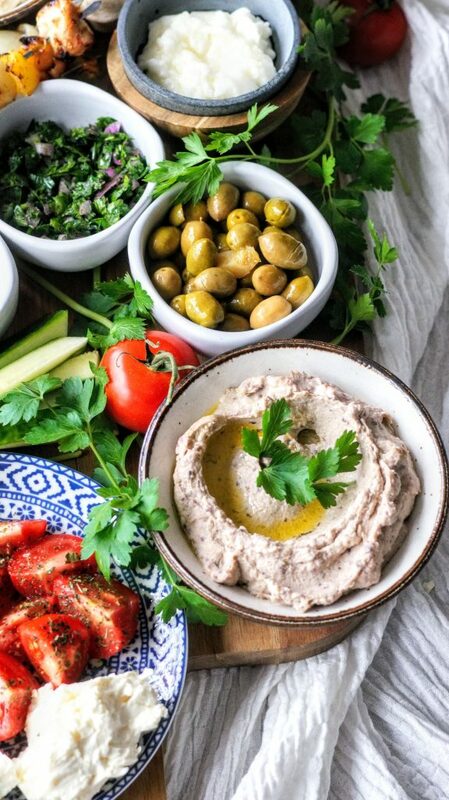 Today I’m sharing my recipe for baba ganoush and pita bread that you can add to your OWN mezze platter. Baba Ganoush, is an eggplant dip with many variations similar to hummus. I personally like my baba ganoush very smooth and creamy versus the traditional thick style. Running the eggplant through a food processor helps to get it silky and smooth. This easy recipe will have you making it weekly along with amazing fresh from the oven pita bread! 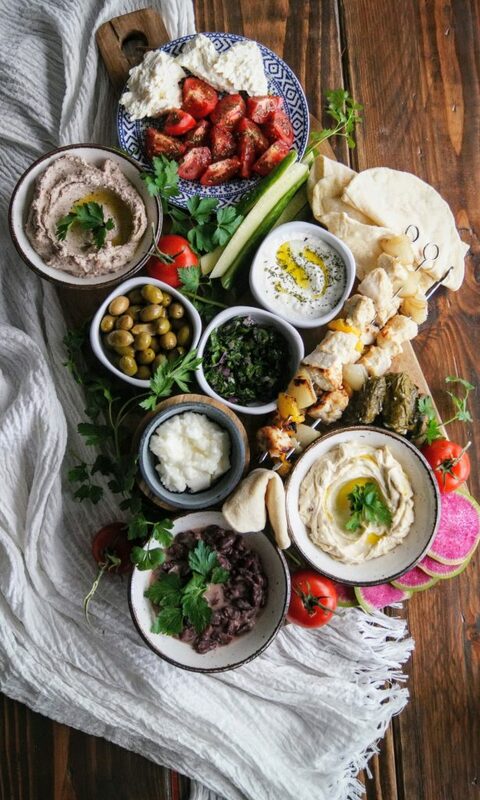 You can click to find other Lebanese Recipes on the blog to add to your mezze platter. 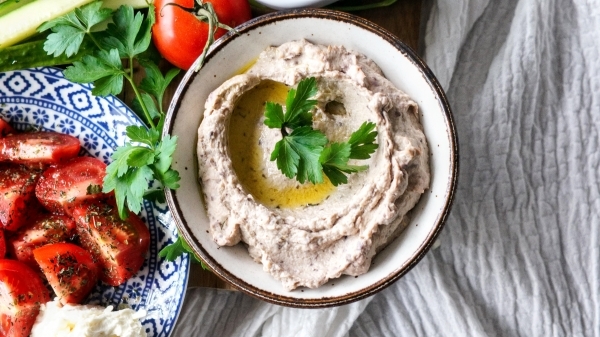 Find the recipes for baba ganoush and fresh pita bread below. As always, I love seeing your creations! Be sure to tag me if you give this a try, Instagram @CosettesKitchen or post on my Facebook Page. 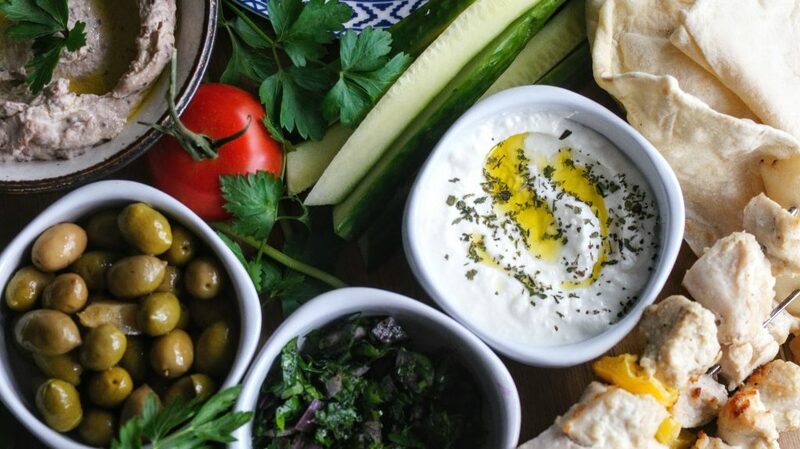 Find these two delicious recipes to add to your own mezze platter. Set your oven to 450 degrees or light your grill. Prepare eggplant by washing and rubbing with a touch of olive oil. Place eggplants on a large baking sheet to roast in the oven or place directly on flames of grill on medium-high heat. Allow eggplants to roast turning every 5 minutes or so to allow each side to char and roast. You'll want to roast for about 15-20 minutes until eggplants are very soft. Once soft, remove from grill or oven and place on a roasting pan, cover with plastic wrap for about 5 minutes to allow the steam to create for easy removal of skin. Once steamed up, remove plastic wrap and begin to remove the skin, it should come off very easily at this point. Place the flesh of the eggplant in a colander and allow to drain excess liquid for about 5 minutes. Place drained eggplant and garlic in food processor and allow to process. Add in your tahini, lemon and salt. Adjust to taste, drizzle with olive oil and enjoy with fresh pita. Preheat your oven and baking steel or pizza stone on 550 degrees and allow to heat for about an hour. In the bowl of your stand mixer fitted with dough hook add your flour and salt to the bowl. In a small measuring cup, add your yeast + sugar and fill with 1 cup warm water (110 degrees). Set aside and allow to bloom for about 5 minutes. With the mixer on low, add your yeast mixture to the flour mixture. Add an additional 1/4 cup warm water if needed to create a cohesive dough. Allow mixer to work the dough for about 5 minutes. Cover bowl with warm damp towel and allow dough to rise for about an hour in a warm space. Once dough has risen, begin to make pita. Take a small piece of dough and roll very thin (as thin as you can go without tearing) on a well floured surface. Place on a pizza peel and place on steel or stone. Pita will only need to bake for about a minute, watch closely as it puffs and once fully puffed, remove from oven and place on a plate covered with a towel. Repeat until dough is done, make approximately 1 dozen pita. Store in a ziplock bag to stay fresh. Best used the day of or heat slightly before using. Don't miss another recipe! Sign up today!